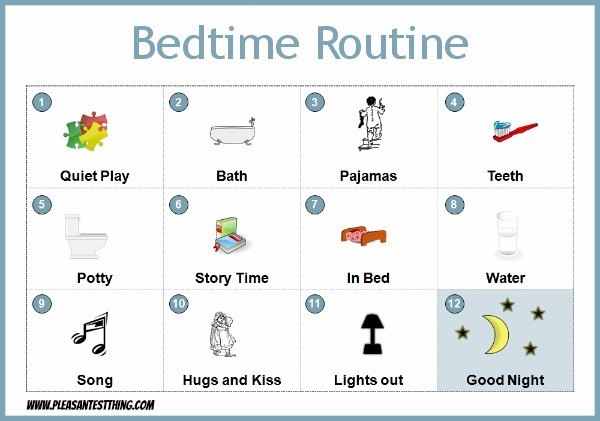 My preschooler loves our morning routine chart so much that he asked if we could make a bedtime routine chart as well. With a toddler and a preschooler, I am all for anything that makes bedtime easier, especially when it’s my son’s idea! The routine starts with quiet playtime, which begins after dinner. We usually read books, play with puzzles, or get out some blocks or Legos. In general, we try to choose activities that don’t involve yelling or running around. Our chart is a picture with simple words, so my preschooler can follow along. He’s a pre-reader, but he has begun to recognize these words in other contexts, because he sees them so frequently. He also gets one last bit of writing practice for the day, as he checks things off of our laminated list (he checks the last few things off in one go). I’ve copied the chart below, and you can click here to download it. We try to stick to this bedtime routine as much as possible. However, sometimes things don’t go as planned. Travel or sickness or family visits can knock us out of the routine. When that happens, we just try to resume it as things settle back to normal. I would love to know what works for you around bedtime. Do you have a bedtime routine?